Ryan Paris (Fabio Roscioli) is an Italian singer who released several tracks that marked the Italian disco era of the early 80s. His first single “Dolce Vita” is a classic to date and outlines the electronic arrangement with the lighter flair taking over dance floors during its release. “Fall In Love” is Ryan’s follow-up from 1984 and was produced by John Bini and arranged by Pierluigi Giombini. It is a beautiful dance track that has always been one of my favorite. 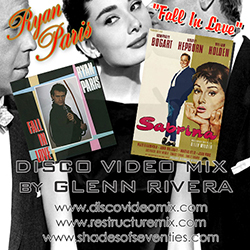 I have worked this Disco Video Mix taking scenes from the 1954 romantic comedy “Sabrina” starring Humphrey Bogart, Audrey Hepburn and William Holden. My premise is to a fix a stare to the wonderful beauty of Ms. Hepburn and leaves a hypnotic trance as the disco track does. The trio in this love triangle plays during the disco refrain and keep the black and white classic alive also. Featuring scenes from “Sabrina” – RENT THE DVD! Video footage used on these projects are used soley to promote purchase of the DVD or CD/MP3.